OVERALL DIMENSIONS: 8 1/2" x 6" x 3"
FILM CAPACITY: 100ft (30m) and 50ft (15m) daylight loading spools of 16mm film. THREADING: Automatic threading and loop forming. The end of the film is simply placed in a channel leading to the feed sprocket. The release is pressed and the film is then automatically threaded throughout the entire mechanism. MOTOR: Constant speed, spring motor mechanism; governor controlled. Large winding handle folds downward and attaches to camera when not in use. Spring cannot be over-wound. 8:1 external drive shaft permits the attachment of an electric motor. TURRET: Rotating turret with folding lever; Accommodates three interchangeable RX type C mount lenses. VIEWFINDER: 6x magnification; Reflex viewing with semi-reflecting prism system; Groundglass focusing; Adjustable to eyesight. The camera comes equipped with an Octameter viewfinder. FILTER SLOT: Built-in slot holds a gelatin filter behind the taking lens and in front of the shutter. RELEASE BUTTON: provides for the making of continuous exposures by a finger-tip release on the front of the camera. A side release allows for locked, hands-free running or single frame exposures. FOOTAGE COUNTER: adds and subtracts accurately in forward or reverse motion and automatically returns to zero when film is reloaded into the camera. AUDIBLE FOOTAGE INDICATOR: A distinct click announces the passing of each 10 inches of film through the gate. This mechanism may be disengaged, if desired, by simply moving a lever. FRAME COUNTER: Twin dial counts frames individually and in total; Adds frames in forward motion and subtracts when film is wound backwards. Dial may be reset manually at any time. SINGLE FRAME: Time lapse and animation is possible by using the side release button or an accessory cable release and adapter; I-T lever allows for timed or instantaneous single exposures. MANUAL REWIND: Clutch disengages spring motor and permits forward movement and backwind without running down the spring; allows for dissolves and superimposition. Click the image logo to your left, to familiarize yourself with the controls and operation of the H16 reflex with helpful illustrations from the original instruction manual. 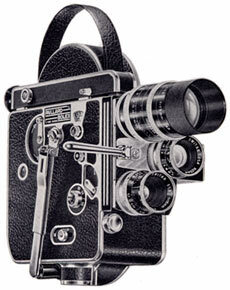 The H-16 Reflex incorporated several new designs to the Bolex H camera. A system of ten optical prisms was utilized in a new viewing system, allowing through-the-lens framing and focusing. Unlike other reflex cameras, the Bolex reflex used a semi-reflecting prism located behind the lens and in front of the shutter. The advantage was flicker-free viewing during filming. However, the disadvantage of the system was a slight loss of light diverted by the reflecting prism (approximately 25%). H16 Reflex, H16 REX, H16 REX-2, H16 REX-3, H16 REX-4 and H16 REX-5. The first model of H16 Reflex is often mistaken for the later H16 REX. Varying terminology among users and sellers also complicates the matter. An original first model H16 Reflex can be identified as such by looking at the viewfinder; the control knob for eyesight adjustment on this model is located on the side of the finder. The most distinguishing feature, compared to later reflex models, is that it does not have a variable shutter control lever. The serial number on this model can be found inside the film chamber, near the top spindle. A matching number can also be found inside the film chamber door. Paillard Serial number data lists the date of introduction as 1956, beginning with S/N 116001. However, according to their same information, 116001 falls into the range of numbers allocated for the 1955 production year. It's possible that it began production in 1955, although it was not officially introduced until 1956. The camera was superseded by the variable shutter H16 REX in 1959. 1 Ted Russell, "New Bolex H-16 Reflex," Bolex Reporter, Spring 1957, 28. 3 Technical Corner, "Lens Mounts On Bolex Cameras and Interchangeability of Lenses," Bolex Reporter, Vol. 14, No. 2, 1964/65, 34.